The Bot Framework provides a service for tracking the context of a conversation, called Bot Framework State. It enables you to store and retrieve data associated with a user, conversation or a specific user within the context of a conversation. In this article, it is assumed you have previous experience with developing bots using Bot Builder SDK (C# or Node.js), so we will not get into the details in terms of bot implementation. Before using Cosmos DB, it’s helpful to understand the importance of storing conversation data and how it is stored in Bot Framework State. Analytics: When you want to analyze user data and conversations in near real time. You can also apply Machine Learning models and tools (like Microsoft Cognitive Services APIs). Audit: When you have to store data of all users for audit purposes. It can even be a requirement, depending on your solution. By default, Bot Framework uses the Bot Framework State to store conversation data. It is designed for prototyping, and is useful for development and testing environments. At the time of this writing, it has only a size limit of 32KB. Learn more about data management. Global distribution: It's possible to distribute your data across different Azure Regions, ensuring low latency to users. Horizontal Scalability: You can easily scale your database at a per second granularity and scale storage size up and down automatically according to your needs. Availability: You can ensure your database will have at least 99.99% availability in a single region. For document models, there are options like Azure DocumentDB and MongoDB. In this article we are going to use the DocumentDB API. 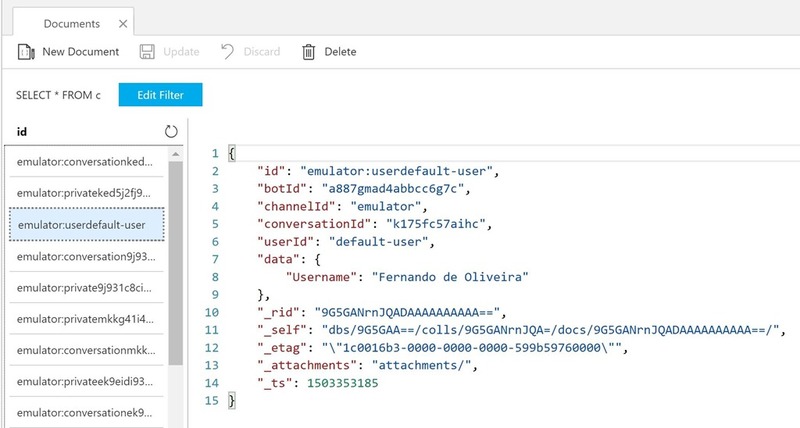 If you run your bot and open your Cosmos DB service on Azure Portal, you can see all stored documents (clicking on Data Explorer). Where is conversation state stored?